It may not be only a dream, Kaji. 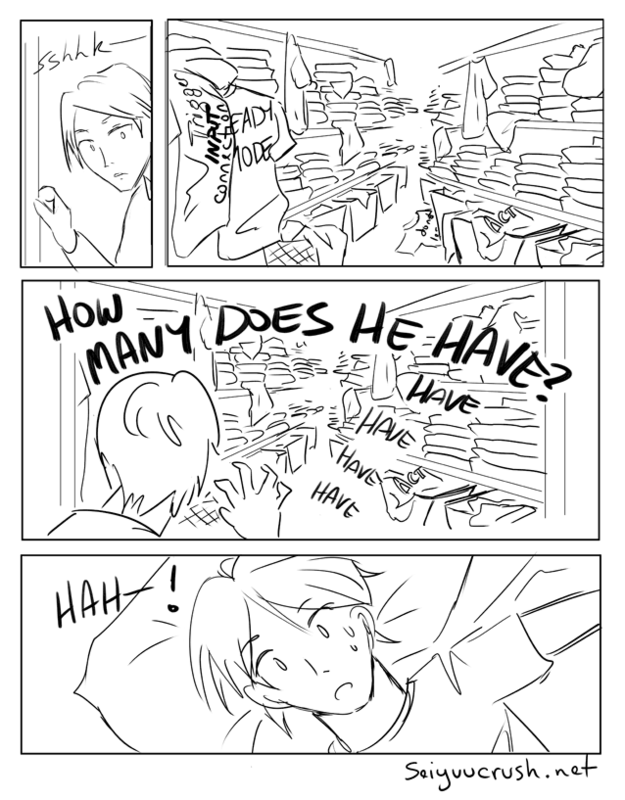 Ever wondered just how deep the dark recesses of KoiZ's closet goes? Just how many t-shirts are in there? And where do they come from? Well, those questions may be a secret for another day, my friends. But we thought we could go back and count as many as we could. 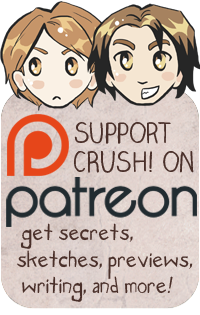 And we came up with a number - including comic scenes, covers, bonus comics, and sketches, some of which aren't on the site anymore - of all the shirts belonging to KoiZ that we have seen. 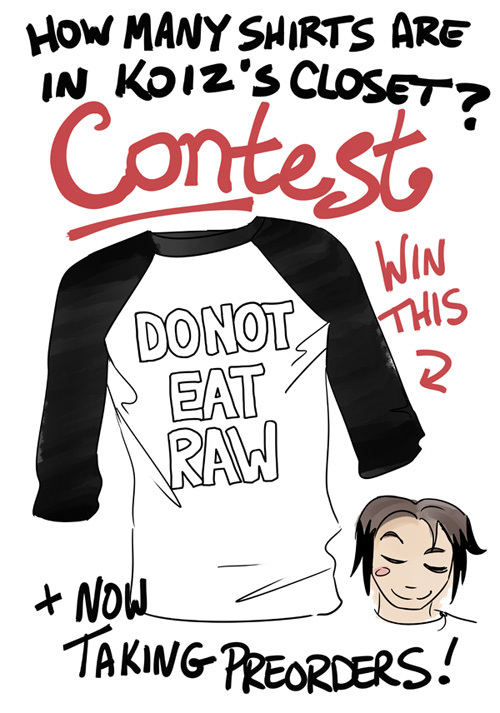 Now we're giving away a "Do Not Eat Raw" T-shirt (featured in Scene 3) to the first person who can guess how many KoiZ shirts we've seen in 5 years of CRUSH! 's existence. Here's how it works: Just enter your guess into the form at the bottom of this page. You only get one guess! The contest will go for a week (until July 7th) OR until someone guesses the right answer. The first person to guess correctly will get a "Do Not Eat Raw" T-shirt shipped to their mailbox, anywhere in the world! (Anyone who guesses correctly after the first person will receive an art postcard!) And if you've already preordered a shirt and you are the winner, we'll refund you. Use the form below to send us your name, email, and guess of how many of KoiZ's t-shirts we have shown so far (not including Kaji's dream above (￣▽￣)). And then head on over to the store to preorder the shirt!